Capturing candid and unscripted moments is one of our favorite things about creating wedding photography for Washington, DC, clients. We think that the best DC wedding pictures reveal the love, tenderness and caring that newlyweds have for one another. In our experience, those emotions are more evident when the couple feels relaxed and loose. If they are stiff or uncomfortable, DC wedding photographers will have a hard time getting photos that are genuine and natural. To make an environment conducive to candid photographs, a Washington, DC, wedding photographer should help the new spouses feel alone. It is absolutely critical that the new spouses forget that they are being photographed. Their entire focus should be on the person with whom they have tied the knot. Even if their Washington, DC, wedding photographer has posed them, the posing should encourage the connection between them. This is the main reason why we rarely have our Washington-based brides and grooms look at the camera. When they do that, they connect with their photographer and not each other. Couples portraits in the Washington, DC, area are even more natural when DC wedding photographers eschew posing altogether. When photographing newlyweds after their ceremony, we will sometimes give them only loose instructions. We put them in a particular location and let them interact as they normally would. The idea is that, over time, the couple will relax and forget that they are being photographed. They will stop being camera-aware and focus on each other. And that is when the genuine emotions come out. It is an approach to DC wedding photography that is not without risk, of course. Posing newlyweds for their couples portraits gives a Washington, DC, wedding photographer control over the situation. They can ensure that the composition is perfect — that there is nothing distracting in the background, for instance. It is also easier to avoid photos in which the bride or groom is talking or making weird face. In less structured photography, a photographer is almost certain to get images that do not turn out. When a more naturalistic approach to Washington wedding photography does work, however, the results are stunning. We get images that reveal how a bride and groom feel about one another. We get pictures that show what binds them together and tells a tiny piece of their love story. We get photos that they will want to put on their mantle and show their future grandkids. That is what happened with the Washington, DC, wedding pictured here. This bride and groom walking in this image had just tied the knot in a lovely outdoor wedding ceremony. Their venue was the glorious Springfield Manor Winery & Distillery — located in near Frederick, Maryland, in suburban DC. The groom’s father presided over their nuptials, which featured a “blending of the sands” ritual that commemorated the joining of the two families. Following their exchange of vows, the newlyweds braved the Washington area’s early-autumn heat to stroll around the vineyard’s grounds. We let them walk and interact with one another as though we were not present. and pose for some absolutely epic and unforgettable images. The resulting photos were candid, natural and beautiful. 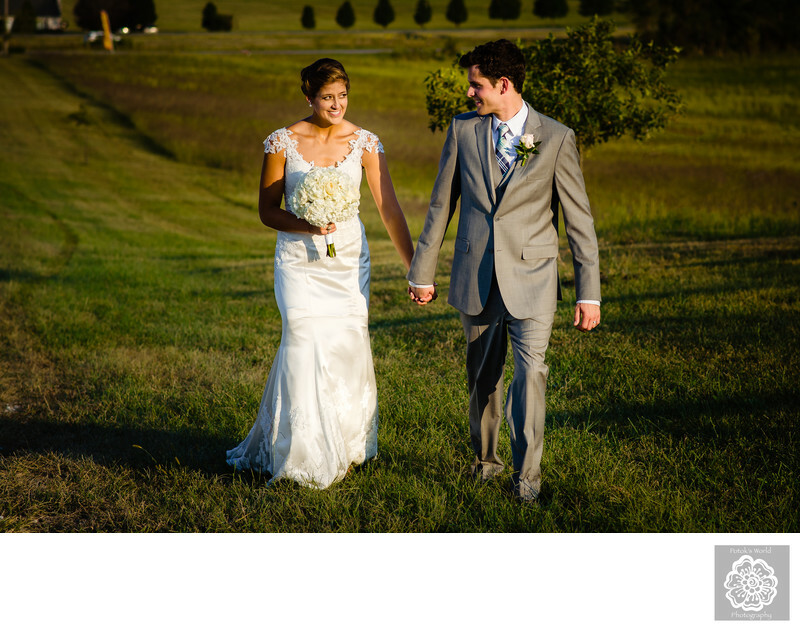 It did not hurt that the rolling hills surrounding the wedding venue injected soft, pleasant colors into the pictures! The highlight of the couples portrait shoot happened on the walk back to the vineyard’s main house. Halfway up the driveway, the new husband and wife stopped and smiled at each other in a beautiful and unscripted way. That was the moment when our approach to the portraiture paid off. We could have never gotten that look and that moment in a posed picture. Because we gave them freedom to interact normally, we (and they) were rewarded with an unforgettable image. And as DC wedding photographers, that is something we want to deliver to every one of our clients.